Spendor announces new A5R speakers | What Hi-Fi? The new A5Rs use trickle-down technology from Spendor's high-end loudspeakers, including a new crossover design and mid/bass driver. 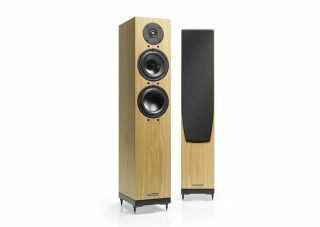 The A5Rs replace Spendor's existing A5 model - in a similar way to when the company replaced its larger A6 floorstander with the A6R. The new model features a new crossover, and a new 15cm mid/bass driver which uses materials developed for Spendor's much more expensive D7 speakers. The cabinet is also taller than the outgoing A5, by just over 3cm. A 15cm Kevlar composite cone handles the lowest frequencies, while highs are delivered by a 22mm wide-surround tweeter. Each driver is individually calibrated and matched for optimum performance. Like the old A5, the compact cabinet is a sealed design and features steel stabiliser inserts in the base, which are claimed to help with precision and detail. Spendor says the latest addition to its 'A' range produces a balanced sound and vivid imaging with a "wide, even listening window". The Spendor A5Rs are available in five finishes; black ash, light oak, dark walnut and cherry veneer, and a satin white lacquer. The new speakers cost £1995 per pair for the veneer finishes and £2195 for the satin white.